At first look, SafeCopy certainly does not provide the perception that they are one of the better cloud backup providers in the industry. Their website is severely lacking in aesthetic appeal and their mobile app is sketchy at best. The performance of their services, however, has enabled them to become known as one of the most reliable companies for cloud backup. SafeCopy is yet another cloud backup provider that does not offer anything incredible as far as features, but does do their job and can be considered as a reliable option. They have very good security benefits and their interface is one of the easier-to-use that you will find. As a provider that specializes in cloud backups, it is absolutely essential that security is top-notch. SafeCopy does not disappoint in this area as they have state-of-the-art security features that ensure the privacy of your files. They use a 128-bit encryption during transfers, which is the same high level security that you will find with a bank. They also have a 448-bit Blowfish encryption for all stored files. Convenience is one of the bigger reasons that users enjoy SafeCopy so much. 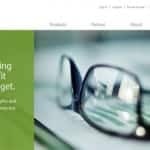 They allow you to manage multiple computers from a single account, which is much more convenient than what a lot of other providers offer. They also allow you to backup anything from flash drives to hard drives. 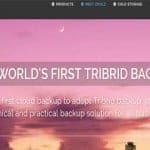 One of the major issues with a lot of cloud backup providers is that they require you to download software before accessing their files on a certain device. You will not have to go through that process with SafeCopy. Whether you are attempting to access your files from your tablet or a hotel computer station, they make it easy to access everything you need from anywhere. While the security features that SafeCopy offers have already been talked about, another cool feature that they offer as it relates to security is the ability to share a link with an expiration date on it. This means that you can quickly share something, make sure the recipient sees it, and then get rid of that link so the information remains as secure as possible. SafeCopy is probably one of the least impressive cloud storage providers available when it comes to customer support. While they do provide the traditional forum support and a few tutorials for getting starting, their only other form of assistance comes from their ticket support. Unfortunately the response times for those tickets are a little longer than they should be for a provider that already is lacking in the customer service department. One of the main disadvantages of using SafeCopy is that their mobile apps are a bit lacking in the development department. They are not very easy-to-use and also have some issues with reliability at times. Both the Android and iPhone apps also have some pretty rough reviews and overall ratings from users. 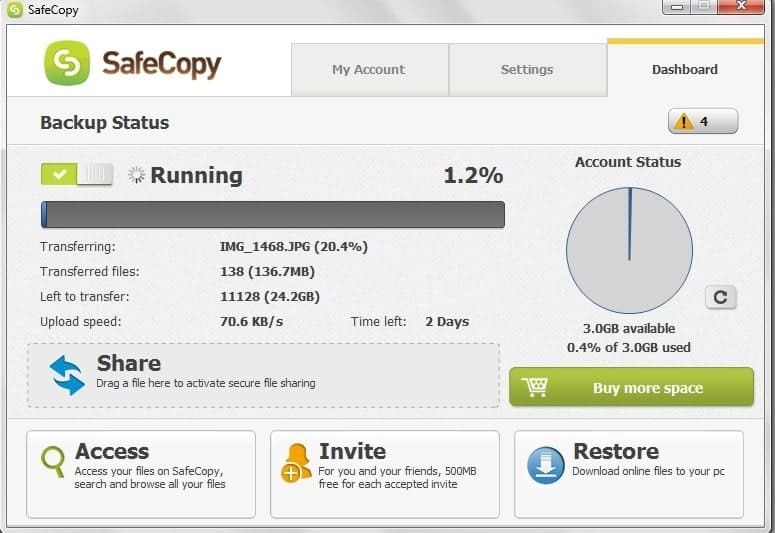 SafeCopy also lacks a bit with customer support, which can be an issue due to the problems with mobile device usage. While they do have the typical email support, the fact that they do not have live chat or phone support is a little disconcerting for a provider that does not excel in too many other areas. The pricing is also an area where SafeCopy is a little iffy. It can be difficult to justify their prices, especially with the fact that they do not offer any unlimited packages. While the security is top-notch, finding value with their features is difficult. 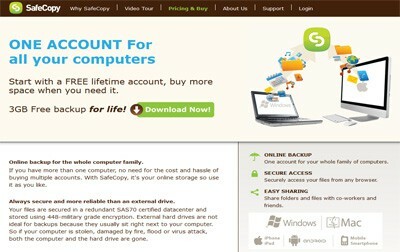 SafeCopy offers three different packages for users to choose from. The first is their Starter plan, which will set you back $50/year and allows for up to 200GB of storage. The most popular package is their 500GB plan, which costs $85/year. Lastly, their largest offered plan gives you 1000GB, or 1TB, of storage for $165/year. While these prices are reasonable, the perception in the industry is that they are a bit overpriced with the lack of features that SafeCopy offers. They do, however, offer a 30-day money back guarantee to users. At the end of the day, SafeCopy does what you need it to do when it comes to securely backing up a large number of files. While they do struggle a bit with features and modern appearance, there are very few complaints about the reliability of what they are actually intended to do. With the fact that they are trusted by over a quarter of a million users 4,000+ organizations and businesses, it is safe to say that they are a safe cloud backup provider that you can count on to get the job done. One of cloud backup providers that provides its customers top-notch security. Easy file sharing which is very convenient. Also features more than 15 languages that allows them to cater different customers anywhere. Other features needs to be improved.